Manage Ads – With a single point of entry, manage your listings on your site in real time. Upload and edit images and content with an intuitive marketing platform. 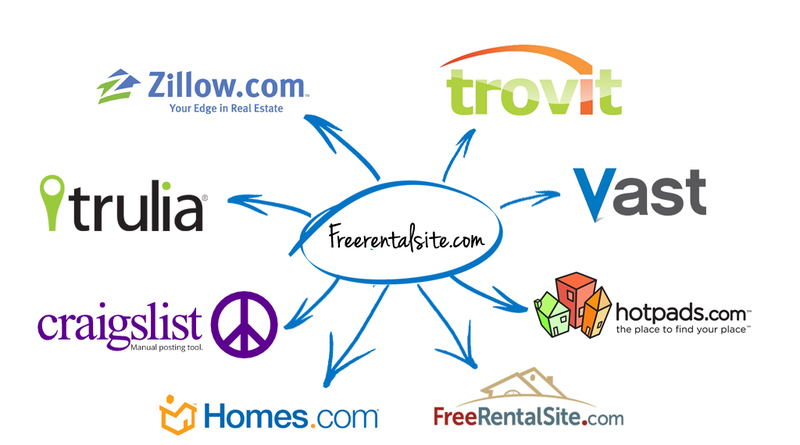 Post Ads – With a simple posting process, post rental vacancies quickly and efficiently. Post your listing once and manage your listing across multiple platforms. With Ad Center, you are in control of you listings. Performance Report – Gain key metrics about the listings traffic, visits, opens, and image views. Be in the know of when to change title or price to make your listing as effective as possible. Days On Market Report – Track when your listing was posted and current stats for each listing to have the information you need to make decisions on when to be more aggressive with a listing. Imagine Optimization – Upload images directly from your camera and have the images optimized to a 1000 pixel to 1000 pixel true high definition image while being completely web optimized for fast viewing and rapid click through galleries. This proprietary software is industry leading. Watermarking – Have your images instantly watermarked on upload. Include a phone number, web address and/or your logo and have all of you images watermarked BEFORE they are distributed or posted. Unlimited Images – Upload as many detailed images as you would like for your listings. Many companies limit your images to 20 per listing, but with our proprietary image optimization software we allow you to upload and host as many images as it takes to showcase your property. Video Integration – With our built in video integration, you can take the url from either Youtube or Vimeo and instantly have a full sized video on your listings. No more dealing with embed code or HTML to display video on your listings. Property Mapping – When you upload your listing for the first time our property mapping software pin points your listing on a map. This allows your website to be updated in real time with map tools to display the most up to date property listings. Near Me – With the near me feature available on our mobile websites, a future tenant can visit your website and click “Near Me” and see visually all of your available listings in proximity to their location. Showing a property in a specific area? This might have just became your new best friend. Borderless Search – With our industry leading borderless search technology a potential tenant can search a radius from a specific land mark, address or intersection. Want to live within 5 miles of work? No problem. Search for your works address and view the properties that are available. Facebook – Integrate your Facebook updates and friends with this social media widget. Any update you make to you Facebook page, will also update on your website. You can also send updates to your Facebook page of random or new listings that come to your account. Twitter – Update your website with your latest twitter updates. Whether is it to show new listings, or communicate with tenants, have your website up to date with this tool. Google+ – Keep visitors in the know with what is happening with your company with your website linked to Google +. Pinterest – Click and share your listing on one of the fastest growing social media sites. Drive traffic and user ship to your website with this integration. Link to This Page – With a unique link to every link on your website, you can use this tool to share a listing with a potential tenant, or email it to them using the email a friend option and drive them back to your site with the latest most up to date information. Property Flyers – With a single click, the property flyers tool allows you to create a PDF flyer to print or email with information that is up to the minute on your listing. Showing the wrong info? No problem. Update the information on the listing in the Ad Center and recreate the PDF. The new flyer will be up-to-date. QR Codes – Each listing has an automatically generated QR code for each listing that allows your users to scan with a smartphone and come directly to your listing information. Make every opportunity a lead. Property Details – With the industry’s most robust property details section, add as much information to inform your visitors about the property. Increase the quality of leads by providing your users the best experience and information. Property Description – With flexible description fields, really showcase your listing how you need. Add as much information as you want. Include video, images, or HTML to create the most compelling listing. Property Amenitites – We work with all of the top rental listing sites in the industry to provide you the most complete list of amenities to add to your property. Is there one that is not included? Let us know and we will add it. Tenant Lead Management – Every property lead will be emailed to you, but it will also be recorded in your Ad Center. Use the messaging tool to quickly communicate with your tenants to answer their questions as quickly as possible.